If you came to Vegas just for the buffets, we wouldn’t have a problem with that. In fact, count yourself lucky since the days of cheap buffets and plastic-tasting food are gone. 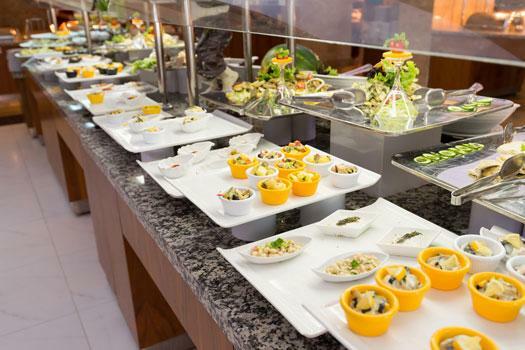 In their place, mouthwatering buffets with every food you could imagine. If you wake up craving something specific the night after a Las Vegas pub crawl, this might be the place for you. Bacchanal serves up more than 500 dishes prepared by 15 chefs each and every day. There are nine open kitchens and add-ons from caviar to lobster. You want a whole fish? Do it. This buffet isn’t just about hefty portions, it’s about customer service for the nearly one million guests that come through every year. This buffet, with its unique name (ha), has eight live-action stations with treats like Indian-style kabobs and fresh-baked naan cooked in an authentic tandoor oven. If you don’t like Indian food, try the paella, crab legs, or the heaps of desserts. They also offer bottomless wine, Bloody Marys, beer, and wine. You’ll feel like you’re dining in a small French village when eating at this buffet. Five made-to-order stations each represent a province in France, offering up tasty treats like quiche Lorraine, steamed mussels and clams, prime rib, leek mashed potatoes, crepes, and a macaroon tower. It’s also the only Vegas buffet that accepts reservations, which can be made online. When this buffet opened in 2010, it took a smaller approach to traditional heaping portions. Instead, Wicked Spoon dishes out fine dining sized portions, along with comparable quality. There’s also an in-house team of butchers who are behind the prime rib, meatballs, and bone marrow. You don’t have to take our word for it. Whether you’re hungover from getting turnt up on a party bus in Vegas last night or just on a mission to try every buffet on The Strip, you’re sure to find a flavor explosion at any of these buffets. If we missed your favorite, let us know!